BANGLI, Indonesia (AP) — A teary and largely silent convicted Australian drug mule returned to her hometown on Thursday hours after she was deported from the Indonesian tourist island of Bali where she had served nearly 14 years in prison for smuggling heroin. Renae Lawrence was the only woman among nine Australians who were arrested in 2005 for attempting to smuggle 8.3 kilograms (18.3 pounds) of heroin from Bali to Australia. 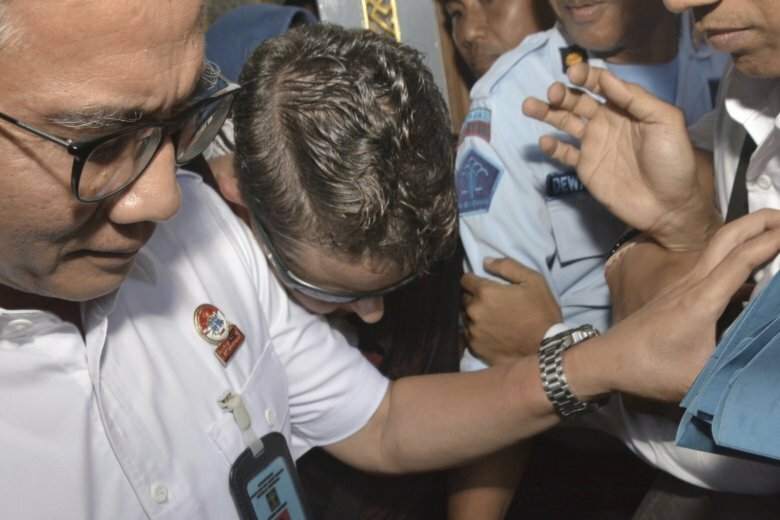 Lawrence, 41, wearing black sunglasses and a black T-shirt, was escorted Wednesday afternoon through a crush of reporters outside Bangli prison on Bali into a waiting car. She made no comment. She faced a throng of media when she and her mother, Beverley Waterman, landed at Australia’s Brisbane Airport from where they took a domestic flight to their hometown of Newcastle. Lawrence faces potential arrest in Newcastle on outstanding warrants that predate her ill-fated journey to Bali. Lawrence faces potential arrest in Newcastle on warrants including one that alleges the former panel beater was involved in a high-speed police chase in a stolen car a month before her arrest in Bali in April 2005. New South Wales Police Commissioner Mick Fuller had indicated a deal with Lawrence’s lawyers to hand herself in to police was more likely than her being arrested at Newcastle Airport. “From our perspective, we will make a time reasonable with her legal team to bring her in to have those warrants satisfied,” Fuller told reporters on Tuesday. Lawrence was again surrounded by journalists and cameras on arrival in Newcastle but said nothing as she walked from the airport to a waiting car. Maryoto Sumadi, head of Bali’s justice and human rights office, said Lawrence is banned from ever re-entering Indonesia. She may be the only member of the group dubbed the “Bali Nine” by Australian media to walk free from prison. Andrew Chan and Myuran Sukumaran, the ringleaders, were executed by a firing squad in 2015, causing a diplomatic furor between often testy neighbors Indonesia and Australia. Five others had their sentences increased to life on appeal, and another member, Tan Duc Thanh Nguyen, died from cancer in May. Lawrence, whom Customs caught with 2.2 kilograms (4.8 pounds) of heroin strapped to her body, was sentenced to 20 years in prison and fined 1 billion rupiah ($68,000). She didn’t appeal and almost every year her sentence was reduced during holiday remissions that are customary in Indonesia for inmates with good behavior, except those on death row or sentenced to life. Lawrence’s sentence was completed in May but was extended by six months because she couldn’t afford to pay the fine, Bangli prison chief Made Suwendra said. Another convicted Australian drug smuggler, Schapelle Corby, whose trial and imprisonment on Bali mesmerized her country for more than a decade, returned home last year. Corby was arrested in 2004 at the age of 27 with more than 4 kilograms (9 pounds) of marijuana inside her boogie board bag, sparking a media frenzy in Australia on par with America’s O.J. Simpson trial. Corby’s insistence that the drugs were planted by baggage handlers was dismissed as a lie by Balinese prosecutors. A court sentenced her to 20 years in prison, though that was later reduced. Associated Press writer Rod McGuirk, in Canberra, Australia, contributed to this report.